Escapism is a theme that is often touched on or alluded to but rarely brought to the forefront in games. Perhaps it’s due to the fact that, for many, video games are their gateway, their escape, their peek into another world where they can be and do what they want without real consequences. But games aren’t the only culprit here. For many, their reverie from the day to day grind is found in music, books, or even other media or substances. Now, there’s nothing wrong with a little bit of rest and relaxation, or in appreciating various forms of media or fare, but it really becomes a problem when you only look forward to escaping at the end of the day, when you ignore your life and those who surround you, when you feel your only purpose in life is found through your escape. But what happens when those lines blur, and you want out? What happens when your escape becomes your snare, and you can’t get out? What happens if the world we live in requires an escape to be liveable? 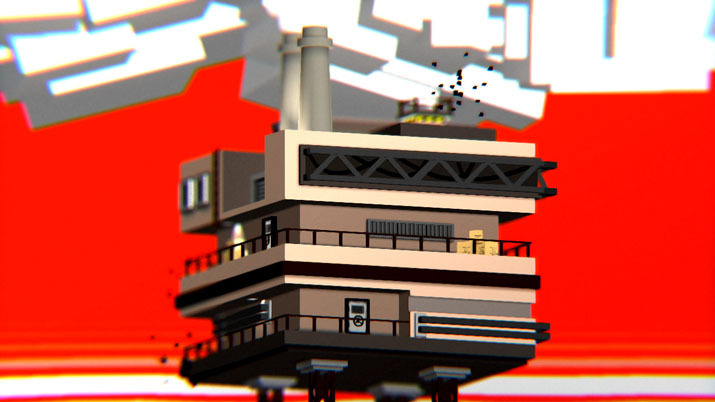 Small Radios Big Televisions is Fire Face Corporation’s latest offering and it's first to be released on Steam. Simply pitched by their website as “a game about exploring digital places stored in analog media,” SRBT is a simplified point and click adventure. Clocking in at under two hours to 100%, you’re tasked with moving from room to room, visiting small worlds via cassette tapes to find keys to open doors in the real world that lead to other rooms and facilities. 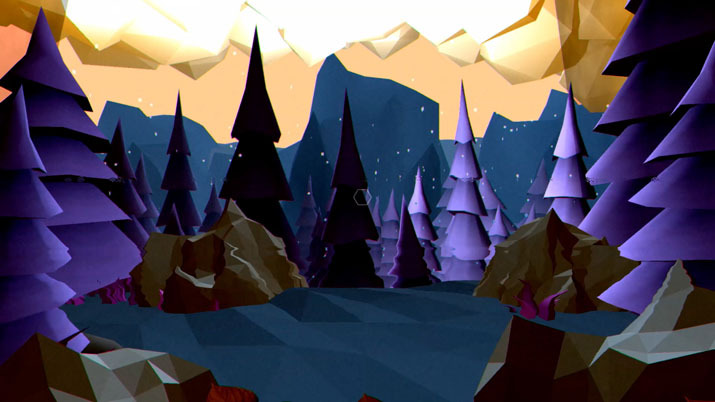 Using a walkman-like device connected to a headset, you play cassette tapes that work as standalone virtual reality stages, transporting the player to serene areas like fields and streams that are eerily as empty as the stages you explore. These cassette tapes are found throughout the compounds, but their data changes when you interact with various magnets, creating twisted versions of their original locales: inverted colors and slowed or distorted music add to the unease of the newly warped product. SRBT’s length is aided by a total of 5 levels with several small puzzles with multiple solutions, hidden lenses found discretely tucked away, as well as small bits of story delivered through recorded conversations that play when traveling to the next facility. Gameplay is almost exclusively mouse based, with clicks used to grab items, open doors, and generally interact with your surroundings. The space bar is your second most used button, as it brings up your deck and current facility’s set of tapes. If you’re actively exploring a digital area, space will remove you back to the current facility. M opens up the current floor’s map but becomes increasingly useless as many stages are multiple floors with doors going up and down flights of stairs and ladders. Puzzles are typically uncomplicated matters of turning on or off the appropriate switch or rotating marked valve handles to a specified position. Finding keys in tape-worlds is also a straightforward matter of looking around until you see what you’re looking for. I found some of the puzzles to be clever, but mostly accessible and in no way a roadblock to the end. Visually, SRBT can take a little bit of time to get used to. Your character has no physical form that is visible but is still held to physical limitations, such as having a path from one door to another blocked by a waterfall that you could easily click around. The foreground (where you keep items you pick up, like keys) and background (where the level is) are clearly distinguished by the change in focus depending on where your cursor is. This can be a little jarring due to the intensity of the contrast, but in practice, it makes the play area’s borders easily defined to the player and is something you eventually adjust to. Once entering the digital world of a cassette, colors play a much more intense role, with large swaths of warm reds and oranges creating a fiery sky, complementing cooler blues and greens of the bodies of water and grass below. The palette choice isn’t the only distinction between the digital and “real” world. Smooth corners and more organic plant life are replaced with chunky, low-res/poly shapes of everything, giving off the feel of a vivid-colored interpretation of 90’s style 3-D graphics. It’s beautifully ugly, in a charmingly fake kind of way, and I like it. More than visuals, though, I love the soundscape of SRBT. Extremely analog in its presentation, the music of SRBT is primarily synth driven sounds that sometimes have a catchy melody, but are primarily atmospheric and airy. Once the player enters the digital worlds, tracks begin to slightly distort, like an old cassette or telephone recording, adding to the lush sounds. Apply a magnet to your current tape and, once entered, the familiar tune will richly decay and warp into something that sounds extremely tampered with and unstable, almost like a film reel being manually turned and close to tearing. It’s wonderfully eerie in most cases; definitely a treat for one’s ears. Unfortunately, pretty looks and great sounds can’t get you everywhere, which is why I spoke of escapism at the outset. SRBT is less a game and more an experience. It’s quick, easy, and formulaic in its execution, making it difficult to recommend based solely off gameplay. On the other hand, it’s visually and audibly attractive, and the story bringing the rarely discussed dangers of escapism to the forefront are great points, especially when looking for a title to talk about and mull over. And maybe that’s exactly why I’m so torn when deciding what to score SRBT: It’s a game that’s much more fun to think about and discuss than it is to play. This isn’t necessarily a problem from my point of view, but for others, it understandably can be. For this reason, and factoring in the $12 price tag, I have to give Small Radios Big Televisions a theoretical 8, but a practical 6. Small Radios Big Televisions is a thoroughly exuberant experience. The gorgeous, very analog soundtrack coupled with stimulating visuals that change dynamically create interesting worlds the player wants to explore more of. The ideas and thoughts this title instigates helps spark new discussions and views to contemplate and reflect among friends. Sadly, lackluster gameplay and a very brief completion time work against the narrative, quickly leaving you to ruminate on your own. As much as I’d love to recommend this title, I cannot at this time. Perhaps it’ll be easier to do so at the next Steam Sale.